Routine maintenance and repairs are part of car ownership. Minor or significant problems can pop-up at any time, but that doesn’t mean you necessarily have the funds readily available to fix it. At Master Mechanic, we never push for repairs that don’t need to be completed, and we’re completely transparent with our customers about this. It’s important to understand which repairs need to be looked at immediately–and which can wait to be fixed. We asked a Master Mechanic about the most critical–and minor–issues they see most often. You don’t want to end up with any of the most costliest car repairs, we previously talked about! You Hear Strange Noises from Your Engine. Your engine is the most expensive and essential part of your vehicle. If you hear clunking or knocking sounds in the engine—especially when accelerating—you need to bring this into a mechanic ASAP. These sounds could be an indication of excessive wear between major components. If left unresolved, serious damage could result. It’s important to have your oil changed according to the schedule in your vehicle owner’s manual. Keeping clean oil in your car engine protects it and prevents potentially costly issues from arising. Regular oil changes performed by a trusted Master Mechanic also increases the likelihood that other problems will be caught early, saving you money. You never want your car engine to be at risk of overheating. Leaking coolant should be considered a critical repair that needs to be looked at ASAP. A warning light indicator on your dashboard could alert you to low levels, or you may notice coolant pooling under your vehicle when parked. This should go without saying, but a tire blow-out is not something you want to experience while driving. It not only puts you and your passengers at risk but also every driver around you. Most tires have wear-bars to indicate when it’s time for a change. You should look for up to six rubber indicators in a row that are recessed in the tread of the tire. When the tread is flush with two of these rubber indicators, it’s time to replace your tire. If your vehicle’s brake pedal travel increases, you might have a fluid leak in your brake system. In any case, issues with your brakes need to be looked at immediately by a Master Mechanic. While a grinding noise is likely worn-down brake pads, you should still bring this in quickly. Staying on top of brake pad changes can actually help your rotors last longer and save you money in the long-run. If You Notice Steering Issues. If you can’t steer, you can’t drive safely. If you notice difficulty steering, your power-steering belt may be damaged, resulting in a power steering failure. If this is the case, don’t attempt to drive your car and call your Master Mechanic immediately! Yes, oil is critical to your engine’s health, but you can wait to fix minor oil leaks. If you aren’t seeing oil on the ground, you’re not likely in immediate danger of damaging your engine. However, no vehicle system is designed to leak that’s why at Master Mechanic, we still advise that you check your levels regularly by looking at the dipstick. If you’re running low, add oil and monitor how long it takes until you need to add more. As a good habit,check about once a month, but if you suspect you have a slow leak, you should check more often. Car manufacturers don’t suggest you change your belts and hoses at scheduled intervals, with the exception of a timing belt. Most belts and hoses can wait to be replaced if they’re not damaged. Typically, car manufacturers recommend inspecting belts and hoses at regular intervals. But if those parts aren’t cracked, splitting or bulging you can wait longer. It’s important to find a trusted mechanic that will be transparent with you about these repairs, so you don’t overpay. Duh, right? 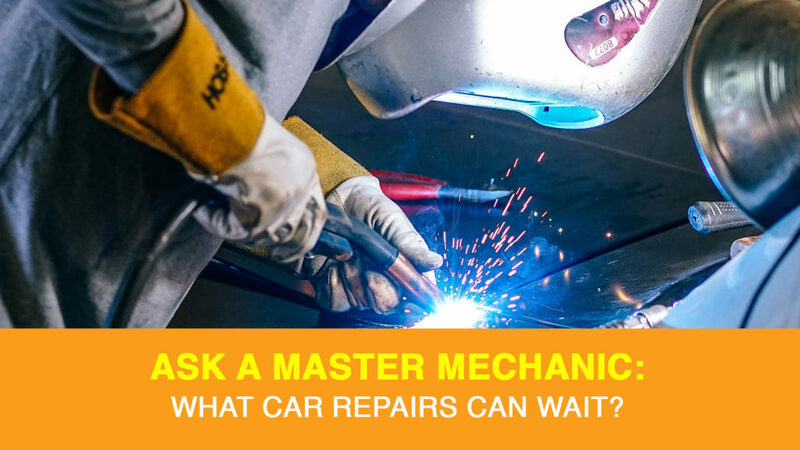 While it may seem obvious, and you’re likely fine to hold off getting these repairs immediately, you should still ask your Master Mechanic. Even though they seem cosmetic, your bumpers cover shock absorbers and other systems that could be damaged in a minor collision. When it comes to scratches, repairs largely depend on climate. If you’re in Ontario, the changing weather and salt used on our roads can lead to rust and other issues. If you have a surface scratch that doesn’t expose the bare metal beneath the paint, this doesn’t need to be fixed regardless of the weather. As we said, it’s imperative to find a mechanic you trust with your car and your pocketbook. At Master Mechanic, we always tell you the repairs we’re doing, and we’ll even show you the used part! If you suspect you need some repairs or routine maintenance, or you have any questions, don’t hesitate to contact your local Master Mechanic today! < Master Mechanic: Lease vs. Finance vs. Subscription?